Cape Town - While it will not be made official until November 15, South Africa look almost certain to host the 2023 Rugby World Cup after having received an official recommendation from World Rugby on Tuesday. 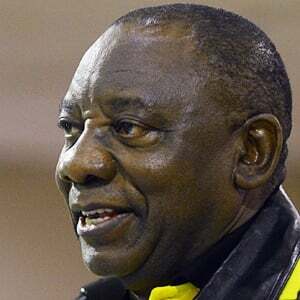 And, as it turns out, the country's deputy president Cyril Ramaphosa was key to the bid being successful in the eyes of the globe's governing body for the sport. Ramaphosa was a crucial addition to the South African bid committee that traveled to London last month to present its case, and both SA Rugby CEO Jurie Roux and president Mark Alexander spoke on Tuesday about how important that move had been on South Africa's part. "We've said it before and I'll say it again, our deputy president made a fundamental difference in our presentation and wooed the crowd," Roux said. "Having the vice president at the presentation was a real killer blow to the process," he said. "He represented the country very eloquently and I think he was received well by World Rugby." According to the report card that World Rugby has issued after its independent examination of the bids, South Africa outshone its competitors in the categories of 'venues and host cities' and 'tournament infrastructure'. For Roux, South Africa's state of preparedness made them an attractive option. "I think we were all pretty much equal in terms of financial resources ... we were all going to make money," Roux said. "In the end, what pulled it through for us was our stadiums, our host cities and our proven track record in terms of hosting international events. "Even though we put forward a pretty good bid, I think a lot of gratitude has to go to previous tournaments in this country and people who hosted those tournaments successfully." The official decision will be made after the World Rugby Council has cast its votes.